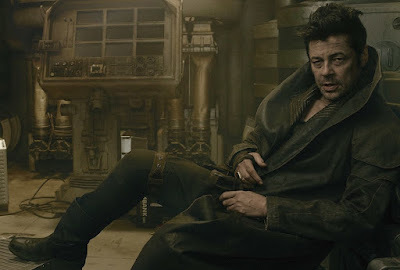 One of the most mysterious characters in the lead up to Star Wars: The Last Jedi is the one played by Benicio Del Toro. Known simply as "DJ", we got our first look at the character in Vanity Fair's The Last Jedi feature back in May. Today, as part of Entertainment Weekly's ongoing coverage of The Last Jedi, EW's Anthony Breznican was able to share a few more details about the character through interviews with Del Toro's co-stars John Boyega (Finn) and Kelly Marie Tran (Rose). "We just need a codebreaker and he’s the best in the galaxy. Unfortunately, he’s very dodgy and only in it for financial gain. He doesn’t fight for any side." According to Boyega, "DJ" sees no difference between helping The Resistance and helping the First Order and will gladly help either depending on the situation (or, to put it another way, whoever is paying him). "When I was onset with that character, I felt like there was a tiger in the room, and I always had to be watching. Like an animal, at any moment he could do something, and I didn’t know what." You can read the entire feature on "DJ" here.